I feel blessed to live in a city with a large Asian population. Information gathered at the last census reveals that around 6.5% of Melbourne’s population is of Chinese descent. The earliest arrivals came seeking their fortune on the Ballarat goldfields during the rush beginning in1851. Most flourished not as prospectors but as merchants trading in food and equipment. Today, the majority of Australian kitchens are equipped with a wok and stir fried family dinners are commonplace. Our supermarkets all have an aisle dedicated to Asian ingredients, the essential sauces, noodles, spices and condiments. 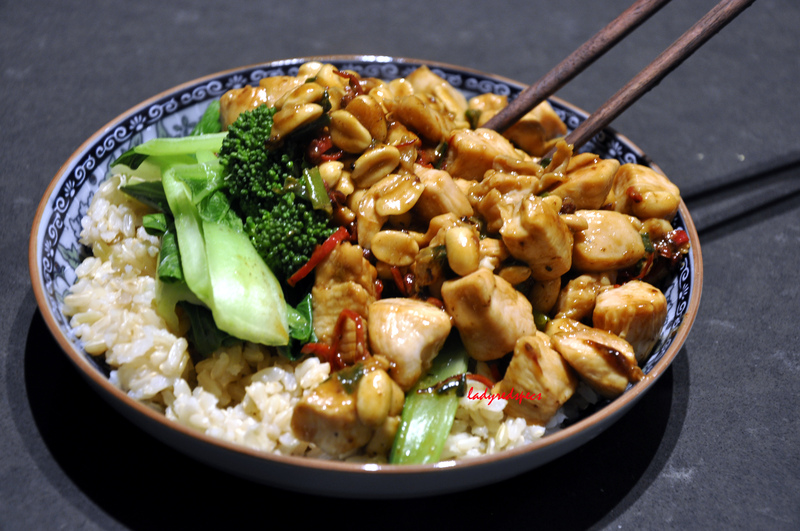 Chinese inspired dishes have become mainstream Australian cuisine. Cut the chicken into 3 cm cubes. Mix the marinade ingredients then stir into the chicken. Set aside. Mix together the sauce ingredients in a small bowl and set aside. Peel and thinly slice the garlic and the ginger. Wash the spring onion and cut into 2 cm slices. Halve the chillis, and thinly slice. Discard the seeds if you want to moderate the heat. Heat you wok until smoking, add the oil, remove the wok from the heat and add the peppercorns and chilli. Allow to sizzle without scorching. Return the wok to the heat, add the ginger, garlic and onion and stir fry for a few minutes. Add the chicken in it’s marinade and stir fry until well coloured and almost cooked. Add the sauce ingredients and stir continuously until thickened. Add the peanuts, toss to combine. Cook for 1 minute longer then serve with steamed rice and greens. Looks way better than the Chinese food I had 2 nights ago at a new resto in town!! Thanks. The older I get the more disappointed I am with restaurants. I go with high hopes but then…………. It is a well balanced dish, plus its quick to prepare. There’s so much to love about Melbourne! quick easy, healthy and yet tasty stir fried recipes! i love the way you playing the texture with peanuts…. I love Chinese dishes and your dish sounds great. Thanks, it’s a simple, quick to prepare and very tasty. Thanks, I love Melbourne too, travelling really reinforces what a great place it is! 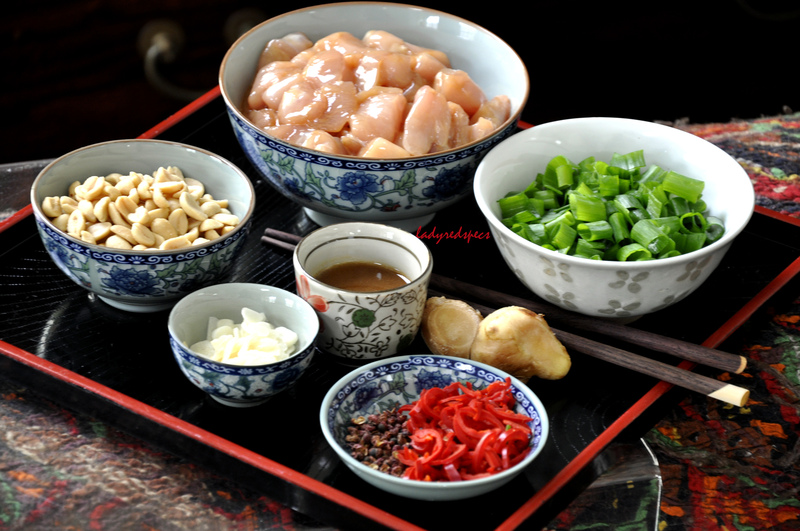 This entry was posted on May 2, 2013 by ladyredspecs in Chicken dishes, FODMAP diet, Food, Gluten Free, Light Savoury Dishes, Main Meals and tagged chicken, chilli, chinese, peanuts, quick.